Global interior designer Kelly Hoppen has taken to the seas by creating a 22,000sq ft (2,044sq m) nature-inspired spa and on-board accommodation for the new the Celebrity Edge cruise line. Hoppen, whose career spans four decades, is known for her subtle “east meets west style based on clean lines and neutral tones blended with warmth and opulence”. She’s put her stamp on the home, yachts and jets of private clients around the world and now focuses on commercial projects including restaurants, bars, hotels – and spas. “The spa has always been a sacred space to me. 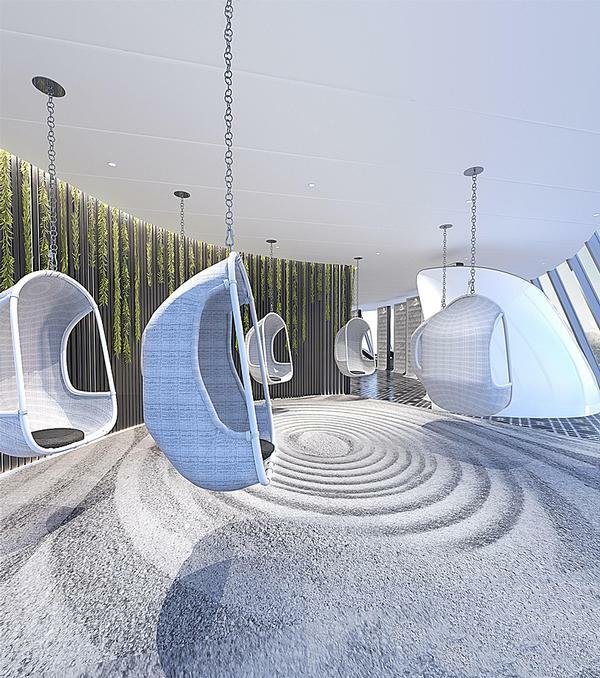 As a young girl, I always dreamt of designing my very own spa and Celebrity Edge proved to be the perfect outlet for living out my dreams,” she says. Natural elements are infused into the experience through a SEA - sea, earth and air – concept. The Thermal Suite, with eight heat experiences, for example, boasts a salt room, rainfall water therapy room, float room and crystalarium. Meanwhile, a Hot Mineral Body Boost, Zero Gravity Wellness Massage and Thousand Flower Detox Wrap are some of the signature offerings. There’s a huge range of 124 treatments available. Elemis Biotec facials are also on the menu and the company has created an Elemis Ingredient Wall which gives insights into the science and natural ingredients behind its products as well as acting as a retail concept. Gharieni has supplied specialist treatment beds including the Spa Wave MLW Amphibia Table which features water-filled cushions to adapt to guests’ anatomy, as well as customisable colour therapy lighting. A medi-spa, Kerastase hair salon and fitness centre offering Bungee Fit and Fitness on Demand virtual workout classes complete the spa. Based in Florida, Celebrity Edge will make her maiden voyage in December with initial cruises around the Caribbean. It’s owned by Celebrity Cruises which has a fleet of 12 ships plus another three being built. Other hospitality projects Hoppen has worked on include the Lux Belle Mare and Lux Grand Gaube, both in Mauritius (see SB17/4 p76).